UPDATE: The Baltimore City Department of Public Works is preparing to begin pouring concrete to make the floor of the first water storage tank. Beginning in early April, a concrete batch plant on the construction site will operate overnight for 24 pours; two pours each week for 12 weeks, weather permitting. Then the floor of the second, smaller tank will be poured; twice each week for seven weeks, also weather permitting. Future portions of the project will include pours and placement of the tank walls, and another round of overnight pours to build the tank roofs. Overnight concrete pouring is necessary to minimize disruption to other construction activity that must proceed during the day. It also ensures a continuous, unimpeded pour for highest quality results. The project is being planned to keep the concrete trucks off of nearby streets, reduce the distance the trucks must travel between batch plant and work zone, and to minimize noise and light pollution for nearby residents. The tanks – one 500 feet in diameter and the second 450 feet in diameter – will each be 40 feet tall and hold 52 million gallons of water combined. They will be buried underground and topped with landscaped green space in the western edge of the lake. The 500-foot wide tank will be the largest of its kind in the world. The lake is remaining in service as a reservoir for drinking water, serving customers in the City and Baltimore County. Most of Druid Lake will remain a recreational amenity. Water will be aerated to keep it fresh, though instead of being drinking water it will be mostly stormwater runoff from Druid Park. The project is on budget and on target for completion in 2022. 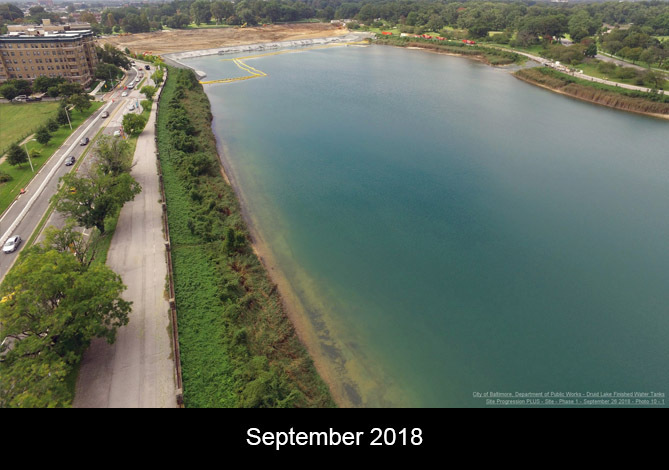 To help secure the City’s water supply, the Baltimore City Department of Public Works is covering a considerable portion Druid Lake and installing two huge underground water tanks. Druid Lake holds filtered and treated water that is ready to be sent to consumers. To protect this drinking water supply, two covered storage tanks, holding more than 50 million gallons of drinking water, will be constructed underground on the western end of the lake. This will mean a slightly smaller Druid Lake, but ultimately an enhanced Druid Hill Park. Visitors to Druid Lake will notice fencing erected along the western portion of the reservoir, closing that portion of the loop road. In addition, tree protection and erosion and sediment controls are also being put in place. An alternate running and jogging location is posted in Druid Hill Park north of the lake. Those who still wish for the experience of walking, running, or biking around a lake may wish to visit nearby Lake Ashburton in Hanlon Park, or Lake Montebello just off of East 33rd Street and Hillen Road. Federal regulations require that finished drinking water must be either covered or receive additional treatment (Safe Drinking Water Act Regulations LT2ESWTR). Covered storage is preferred as a long-term solution for maintaining water quality. DPW has recently completed other covered reservoir projects include Towson, Montebello II, and Pikesville. Guilford Reservoir is currently under construction, and Lake Ashburton will soon be, also. Together these will hold 52 million gallons of water. New piping will connect the tanks to the existing system. The cost is approximately $140 million. 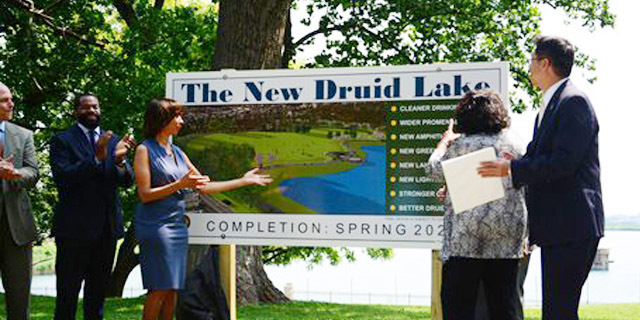 The Druid Lake project will be completed in March of 2022. Druid Lake was designed not only to support the City’s water supply but to enhance the public’s enjoyment of Druid Hill Park. The project will ensure that the lake remains a public recreational asset for generations to come. A new curvilinear shoreline to mimic the current shoreline. Maintenance of lake level and provision of lake aeration system to assure water quality. Mature trees around the lake will be well-protected during construction, along with the monuments, pavilions and statues. The Tsunami Memorial Trees will be relocated in the park. DPW will be providing additional information on this website as the Druid Lake Project progresses.